Will Takedown upload match results to weigh ins to my team’s Trackwrestling account? Can I merge data from multiple iPads? I’m having trouble purchasing a subscription. Who should I contact? A: Apple support. The entire transaction is conducted by Apple. There’s a roster missing in the online database. What should I do? A: Send an email to support@levelchanger.com with the team name and state. We’ll try to find the team and put their roster into the database. Do you automatically store a copy of my database in the cloud? A: No, all of your data is stored on your iPad. We recommend backing up your Takedown data as often as practical. LevelChanger is the developer and publisher of the Takedown line of wrestling apps. For information about our company, click here. What is Takedown Scoring and Stats? It is a highly engineered, native iOS app that is downloadable from the Apple App Store, just like any other app that runs on your Apple mobile device. Takedown runs on any iPad with a compatible version of iOS. All Takedown features are sharply focused on reducing workload for coaches and managers. Takedown does not do tournament bracket management and, as such, is not intended for use by tournament managers. Over 290 versions of the app have been built and tested over the last five years and roughly 50 of those have been released for download from the App Store. Who uses Takedown Scoring and Stats? Colleges, high schools, middle schools and clubs in forty nine states. See About form more information about customers. Does Takedown require an Internet connection? No Internet connection is required. Takedown Scoring and Stats is designed to operate in stand alone mode. Of course, if you want to email or post results or share your data then an Internet connection is required. See this page for current release and history. Any iPad with a compatible iOS version. This includes iPad, iPad Mini, iPad Air, iPad Pro. The iPad 1 is not supported and iPad 2/3 is not recommended because of slow processing speed. What minimum version of iOS is supported? iOS 9 for everything except video recording which requires iOS 11. Can I used multiple iPads for the same team? Yes. Data can be shared and consolidated between multiple iPads. Click here for blog posts and here for tutorials. Can I use the iPhone? No. Phones lack the required screen space to easily score a wrestling match. Are National Collegiate Athletic Association (NCAA) scoring rules supported? Are National Federation of State High School Associations (NFHS) scoring rules supported? Yes. This is the rule set used by pre-college folkstyle programs including high school, junior high school, middle school, elementary school and clubs. Can I customize weight classes and period durations for non-standard events or pre-high school programs? Can I score freestyle and greco matches? What is the cost to download the app? Takedown Scoring and Stats is free do download from the App Store and includes the ability to score up to 30 individual matches. How do I score matches after the first 30? The ability to score additional matches can be purchased in in Takedown (Settings>>Takedown Store). We offer seven day and annual subscriptions allowing unlimited match scoring during the subscription period. We also offer individual matches in sets of 50 and 200. Current pricing is available in the app (Settings>>Takedown Store) and on our app page listing here. We recommend the annual subscriptions as they are the best value for most wrestling teams. By Apple through their App Store. For more details about the App Store, click here. Can purchased, un-scored matches be transferred to another iPad? No, purchased un-scored matches are specific to the iPad on which they are purchased. Can purchased, un-scored matches be transferred to another iTunes account? Only on the iPad on which the matches were originally purchased. In our experience, this Apple process is unreliable and confusing. Is there an option to purchase an unlimited number of matches for the season? Yes and that is the best value for most teams. Can a subscription be transferred to another iPad? Any subscription is valid on all iPads registered to the original purchaser’s Apple ID for no additional fee. No. Video features are optional and purchased separately. Can I get a receipt for my purchase of the app and additional matches? Yes. Apple emails a receipt for every App Store purchase. For more details about App Store purchase history, click here. Can I use a gift card to purchase an unlimited matches subscription? Can I temporarily change my iTunes account to purchase matches? We don't recommend this the outcome is uncertain. A better solution is to have that iTunes account send you a gift certificate via email. Here's a link for iTunes Gift Cards by Email. My subscription isn’t working, what should I do? Does Takedown offer integrated video recording, playback and cloud storage capabilities? Yes. See this blog post for more details on this feature. Does Takedown offer scoring graphics for advanced video production? Yes, we offer automatically generated, network-based, real-time scoring graphics. See this tutorial. Is my data automatically stored in the cloud? No, we do not store your data in the cloud. All of the match scoring data is on your iPad and it is private to you. Yes and frequently. The most reliable way to backup your Takedown data is with the Season Export feature. You should do this after each event. Click here for more information. You can also use iTunes to backup your iPad. Can your company restore my data if my iPad is lost, stolen or damaged? No, we do not have access to your data. Can I restore my data if my iPad is lost, stolen or damaged? If you've backed up your Takedown database with the Season Export feature, you can easily restore your Takedown database. You can also use iTunes to backup and restore your iPad. Can I make a local (stored on the iPad) backup copy of my Takedown data? Yes. With iOS 9.x, you can "share" your Seasons. This process will copy your Season to your selected on-device destination. Do I need to re-enter my team's schedule for every season? No, you can copy a previous season's Schedule and make changes -- dates, times and locations -- as necessary, delete events that are no longer relevant and add new events. Can I import my roster spreadsheet into Takedown Scoring and Stats? Yes. Please see this blog entry and this tech note for details. Do I need to re-enter my team's roster for every competition? No, just enter it once at the beginning of the season and all those wrestlers will be available for any event in the same Season. You can import your roster from our cloud database (over 9,000 teams), import from a spreadsheet, copy from another season or enter the information manually. Do you have college rosters? Can I add and delete wrestlers from my roster? Yes, easily. If you remove a wrestler from your roster -- a graduated senior for example -- the scoring data remains in the database for reporting and statistical purposes. Do I need to enter my opponent's roster for every competition? No, an Opponent Team and associated wrestlers are in Takedown, that team will be available for all events in the same Season. Do you provide rosters for downloading? Yes, our online database of over 9,000 high school and college teams is easily accessible within Takedown. With a single tap, you can download as many rosters as you need from our cloud database. For a tutorial, click here. How many opponent teams can I download? Limited only by the size of your iPad's memory. Takedown enforces no limit. Many users download all teams in a single state or in multiple states. Can I export my Takedown data to a spreadsheet? Yes, many of the statistical reports can be exported to a spreadsheet. This is especially useful for charting and graphing. Can I copy scoring data from a paper score book? Yes. However, be sure to let Takedown know that you're "Copying" the scoring. Takedown will ask you that question at the end of any match it suspects is being copied from paper. This is important for preserving the usefulness of statistics -- short time scoring, for example -- that need an accurate match clock. Can I print my administrative and statistical reports? Yes, all of the statistical reports can be printed from within the app if you're connected to an iPad-compatible printer. Can I print reports without an iPad-compatible printer? Yes. Email the report and retrieve it on a device -- laptop or desktop, for example -- with printer access. Can I save my administrative and statistical reports? Yes. All reports can be saved in Portable Document Format (PDF). Many reports can be saved in image and comma separated variable (CSV) formats. The box score is available in the text format preferred by most newspapers and media outlets. Yes and frequently. The most reliable way to backup your Takedown data is with the Season Export feature. You should do this after each event. Click here for more information. Can I export my reports, statistics and season database to cloud storage services like Apple Files, Dropbox and Google Drive? Yes, these options are available in Takedown Scoring and Stats if you've installed those services on your iPad. Can I upload match results and weigh-ins to the OPC hosted on Trackwrestling? Is there a paperless weight management feature? Do I need to enter a Certified Weight (also know as "Minimum Weight Class") for my wrestlers? No. However, if you enter a Minimum Weight Class (MWC) then Takedown will utilize that information to prevent user errors. MWC, if available, is downloaded from our database for My Team and Opponent Teams. Do I need to "weigh-in" my wrestlers for each event? No, it is optional. However, if you enter weigh-in data then Takedown will utilize that information to prevent user errors. Do I need to "weigh-in" opposing wrestlers for each event? No, it is optional. However, if you enter weigh-in data for opposing wrestlers (available for dual meets only) Takedown will utilize that information to prevent user errors. For a dual tournament, do I need to re-enter My Team weigh-in data for every dual meet? No. Enter weigh-ins for the first dual meet of the tournament and then copy that data to subsequent dual meets in the Weigh In Wrestlers section. Can I copy weigh-ins from any event to any other event? Yes. This is a big time-saver. Is weigh-in data stored in the cloud? No. All of your data is stored on your iPad and is private to you. Backup your database frequently. Can I create custom weight classes? Can I upload weigh-ins to the OPC hosted by Trackwrestling? Can Takedown support more than one team or program? Not easily as each Takedown installation is designed for single team or program use. Can I name my team whatever I'd like? Yes. Click here for a tutorial. All reports will include the new team name. Can I add my team logo? Yes. Click here for a tutorial. We use Seasons to segregate schedules, rosters and scoring data from one year to the next for reporting and statistical purposes. How is a Season defined? A season is defined by a name you assign (typically, something like "2015 - 2016" but it's up to you), a start date and end date, again of your choosing. What does a Season contain? Each Season has a Schedule of events, your team Roster, a list of Opponent Teams and all associated scored matches. Can I add a free-form note to a Season? Are Seasons in Takedown the same as Seasons in Trackwrestling? Conceptually, they are similar in that they both contain events and rosters defined over a period of time. In Takedown, however, you decide how many and what type of Seasons to create. How many Seasons can I have? As many as you'd like. In the fall of 2018, many of our customers are adding their sixth Season. Six seasons of data is pretty awesome if you're trying to build a legacy for your program. I just started using the app. Can I add scoring from previous seasons? Yes. For example, create a Season called "2017-2018" and enter the corresponding scoring data from your paper score book or other source. A list of dual meets and tournaments. Just like your paper schedule. How many Schedules can I have? My JV and Varsity Schedules are slightly different. How should I deal with that? Events are categorized as Varsity, JV, Freshman, Middle School or Other -- we call that "Competition Level." For reporting purposes, you can select the Competition Level of interest to keep the stats separate. But, if you'd like to have separate JV and Varsity Seasons, that works, too. In this case, title your Seasons something like "2015-2016 JV" and "2015-2016 Varsity." Do I have to re-enter my Schedule every year? No. Copy the Schedule from any other Season and edit dates/times as required. Should I add the text "Varsity" or "JV" to my Event name? Isn't necessary, the app allows you to specify the competition level and displays that information in the appropriate places such as Schedule, Match Scoring and Reports. Adding the competition level to the Event name will create redundant labels -- such as "Washington HS Varsity -- Varsity" in the app. A dual meet or individually bracketed tournament. Schedule multiple dual meets on the same date for a dual tournament, quad or tri. How is the Event defined? An Event includes the following information: event name, opponent name (dual only), date and time, competition level, location, weigh-in (optional), weight classes, first weight class wrestled (dual only), period lengths (including consolations for tournaments), 2nd period choice, official's and scorer's name (optional, dual only), team and individual place winners (optional, tournament only) and notes (optional). A dual meet optionally contains a list of expected regulation and exhibition match ups that are automatically loaded into the Scoring interface. How do I Schedule and Score a dual meet? How do I Schedule and Score a tournament? Can I have separate JV and Varsity Events? How do I schedule a dual tournament? A dual tournament is simply a series of dual meets over a short period of time, typically one or two days. Schedule each opponent as a dual meet with the appropriate date and time. You can give your dual tournament a Name which is different from the opposing team's name. Can I manually select the first weight class to be wrestled in a dual meet? Can the app do the "random draw of weight classes" as required in Rule 1.2.2 (NFHS Wrestling Rules)? Yes. This is optional but you should use it. How many Events can I have can I have on a Schedule? Can I pair wrestlers for weight classes before entering the Scoring section? Yes. You can also create exhibition matches in the Pairing section. Can I download my team's Roster from your database? Over 9,000 middle school, high school and college rosters exist in our database, so the chances are good. For how to download your team's roster, click here. My Team's Roster isn't in your online database, but I have it in a spreadsheet. Can I import my Roster from a spreadsheet? What's the minimum amount of information required to add a wrestler to My Team's Roster? What else can I enter for a wrestler on My Team? Photo, grade or college year, birth date, telephone number, email address, weight certification data, equipment issued/returned and notes. The more information you enter, the more value you'll get from the app. Can I remove a wrestler from my Roster? Yes. For removed wrestlers, associated match scoring data remains in the database for reporting and statistics. Can I manually add a wrestler to my Roster? Is an Internet connection required to add a wrestler to my Roster? Is My Team's Roster stored in the cloud? Your roster from the certification process is probably in our database. However, any changes you make to your roster in Takedown Scoring and Stats is not uploaded to our database. Your detailed roster information is stored on your iPad and is private. You can share your Roster at your discretion and with varying levels of detail. How many wrestlers can I add to my roster? Can I add a photo for each wrestler? Do you support a "conference" or "non-conference" designation for opposing teams? Yes. And reports can include or exclude opponents based on this designation. This is especially helpful for post-season tournament seeding. Can I add an opposing team's wrestlers without an Internet connection? Yes. Any wrestler can be manually added. What is an Opponent Team? A named list of wrestlers, typically representing a school, college or club program against which you compete. How do I enter an Opponent Team? Download Opponent Teams from our cloud database or enter manually. We maintain current rosters for over 9,000 high schools and over 400 colleges. Do you maintain rosters for prior seasons? Yes, rosters back to 2012 are available for download in the app. I'm a college coach. Can I download all the college teams and be done with it? Yes, easily. Never know who you'll encounter at an open tournament. I'm an Ohio high school coach and we wrestler only Ohio schools. Can I download all the Ohio teams and be done with it? Yes, easily. There's an option to download all teams in a state. I'm still an Ohio coach. We often wrestle against Indiana and Pennsylvania teams. Can I download those teams? Yes, easily. You can download any team(s). How many Opponent Teams can I have in Takedown? Limited only by the memory and performance of your iPad. Takedown does not enforce a limit. Can I add an Opponent Team Logo? Yes. This logo will display on the scoreboard during a dual meet. I'm in the scoring section, but nothing's happening. What next? Select your wrestler and the opposing wrestler, then tap the match clock in the center. In the scoring grid at the top, the team on the first line is always "My Team." Can I add Opponent Teams and wrestlers in the Scoring section? Often, we can't enter the information ahead of time. Yes, it is possible to add the opposing wrestler (and team affiliation if necessary) in the Scoring section. A better approach is to download all the teams you could possibly encounter during the season and that will reduce the need to add wrestlers manually in the Scoring section. Also, for dual meets you can pair contestants in advance of the dual meet. This is optional and is easily overridden in Scoring. Can I add exhibition matches "on-the-fly?" Yes, as many as you'd like with or without a weight class assignment. Can I score weight classes in any order? Yes. You can also interleave exhibition matches with regulation matches. Can I change my wrestler's color in the scoring grid from green to red to correspond with the ankle bracelet color assigned by the official? Yes. You can change the color at any time. I selected my wrestler and the opposing wrestler, but nothing's happening. Start (and stop) the match clock by tapping it. Always use the match clock. Do not use override to avoid starting/stopping the match clock. Override should be used sparingly. But, the Takedown match clock and the official match clock aren't showing the same time! Won't that mess everything up? Unless you're the source for the official clocks, don't worry. Use the "+" and "-" buttons to get the Takedown match clock to agree with the official match clock if you'd like. If the Takedown match clock expires and wrestling is still happening, just add time by tapping the "+" button. There are statistical reporting benefits to having the Takedown match clock agree with the official match clock. Specifically, the Riding Time, Short Time Scoring and portions of Wrestler Profile require an accurate match clock. Why are the scoring buttons greyed-out? To prevent scoring errors. The scoring interface knows the match context and permits only legal scoring actions based on the current National Federation of State High School Associations (NFHS) or National Collegiate Athletic Association rule books, depending on how you've installed the app. But, I need to use one of the greyed-out scoring buttons? Tap Override and all the scoring buttons will be visible. Override should be used sparingly. Can I add a generic point (or two) to the match score to compensate for action that I missed? No and click here to understand why that's a really bad idea. Use Override or Undo to correct an error. Override should be used sparingly. How do I erase a scoring error? The Undo button will erase the last visible scoring action. You can tap the Undo button more than once. Once the match clock starts, you can not Undo the previous period. Do you support Injury, Blood and Recovery clocks? Yes. Tap the appropriate colored chevron("<<" or ">>") on the side of the Scoring view. Do you support Choice on Restart after injury? How is start-of-period choice managed? For a dual meet, go to the Schedule and select the event, then on the right side select Odd or Even for your team and 2nd period choice will be offered to the correct wrestler in each match. For an individually bracketed tournament, 2nd period choice is always official's coin flip so there is no Odd/Event choice to select for a tournament. For both dual meet and tournament, the app offers choice to the correct wrestler in the 3rd period. Is "defer" an available choice? Do you support stalling and cautions? Yes. Correct points are tallied into the non-offending wrestler's match score. Do you support the full range of penalties? Do you support team penalty points? Yes. Team penalty points are subtracted from the offending team's score. Yes. The regulation scoring grid transitions to an overtime scoring grid if regulation ends in a tied match score. Can I change the view from overtime to regulation time and back if I need to check something? Yes. Swipe the scoring grid left to right to go back to regulation and then right to left to go back to overtime. How do I record a intentional release (escape) on the restart? On the restart, tap Override and tap Escape prior to starting the match clock. Click here for tutorial. In a tournament, do you support different period durations for Championship and Consolation matches? Yes. Also, within an event if a loss is recorded then that wrestler's additional matches will automatically use Consolation period durations. Is Riding Time and Riding Time Advantage tracked? Yes, for college matches. Riding time clock operation is automatic, no user action required. Each wrestler's riding time clock is adjustable. The riding time advantage clock is non-adjustable as it is simply the difference between each wrestler's riding time. A riding time advantage point is added to the match score when appropriate. Is Riding Time Advantage noted at the end of each period? Yes, in compliance with NCAA rules. Did you know that was a rule requirement? Can I copy match scoring from a paper record into Takedown Scoring and Stats? Yes. Be sure to start the match clock in each period. Don't use Override to avoid starting the clock. Override should be used sparingly. Make sure to tap "Copying" if Takedown asks. Can I stop scoring an event and score some other event? Yes. This can be done between matches. If you try to switch in the middle of a match, Takedown will give you the option of finishing the match or throwing it away. If a dual meet ends in a tie, can I record the winning team? Does the app automatically determine the winner of a dual based on tie-breaker criteria? No, but the Scoreboard and Scoring Details reports will help you figure out the winner very quickly. When I finish scoring a match, the app asks if the match is Live or Copied. What does this mean? If you are copying scoring from a non-live source, a paper scorebook for example, then the match clock is obviously inaccurate. Some of the statistical reports rely on an accurate match clock. So, when the app "senses" that you're copying from a non-live source, it asks for confirmation. If you say that the match is Copied, then that match won't be included in certain statistical calculations -- short time scoring, riding time and various stats in Wrestler Profile -- that assume a valid match clock. Oops. I scored a bunch of matches into the wrong tournament. Can I re-assign them to the correct tournament? Yes. For this and other ways to correct errors, click here. It is possible to correct many, but not all, scoring errors after the fact. For example, it is possible to change the contestant names, weight class, event assignment and match type after the fact. It isn't possible to change the scoring transcript after the match is committed. I paired two wrestlers for a weight class in a dual, but the coach sent someone else to the table. What now? You can override any pairings by simply selecting a different wrestler in the Scoring view. How can I record scrimmages or other events without messing up my statistics? Create a Season called “Scrimmages” or “Exhibition Events” or whatever you’d like. Or, in your official Season, create a tournament event called “Scrimmage” or “Exhibitions” or whatever you’d like and run all the matches as “Exhibitions.” There are other methods. In any case, it is easy to exclude a Season or an Event or Exhibition matches when generating stats. Can I create a report without an Internet connection? Yes. All your match scoring data is stored on your iPad. All of the processing and calculations for creating the report are done on the iPad. Tap "Report Selection" in the upper left corner of Reports. Standard scorebook, box score, scoring detail, win/loss, seeing meeting, riding time, wrestler profile, short-time scoring, shot success rate, points-by-period, leader board, schedule and roster. How do I narrow or expand the amount of data shown in the reports? Tap "Report Selection" and then tap the blue circle "i" to the right of the report of interest. Typically, a second or two. Complex reports -- Wrestler Profile, for example -- can take longer. What are the various ways in which the data in a report can be expanded or narrowed? By season, event name, wrestler, competition level or event format. Forfeits can be included or not. Some reports -- seeding meeting, for example -- have sorting options. Can I combine data from multiple seasons into a single report? Can I narrow a report to focus just on varsity events? Can I narrow a report to focus on specific opponents or tournaments? Can I prepare an end-of-season stats report for our awards banquet? Can I prepare a wrestler's career report and email it to a college coach? Can I prepare a leader board report for posting in the practice or locker room? Over what time frame is short-time scoring calculated? Over the last 5, 10, 15 and 20 seconds remaining in each period, user selectable. Is the riding time report available for high school? How long is the ranked list in the leader board? Each stat is displayed for 3, 4, 5, 10, 15, 20 or all wrestlers, user selectable. How many stats are tracked in the leader board? In what formats are the reports available? Adobe Portable Document Format (PDF), spreadsheet (CSV), image and text. Yes, from within the app by tapping the Apple "sharing" icon -- a square with an embedded up arrow -- in the reports view. Email needs to be installed and configured on your iPad. What do you mean, "sharing" icon? What does it look like? Can I post reports to Facebook user timelines, Facebook pages or Twitter timelines? Yes, from within the app by tapping the Apple sharing symbol -- a square with an embedded up arrow -- in the reports view. Facebook and Twitter need to be installed and configured on your iPad. Can I text message reports? Yes, from within the app by tapping the Apple sharing symbol -- a square with an embedded up arrow -- in the Reports view. Apple's Messages app needs to be installed and configured on your iPad. Yes, if your iPad's is on a network with an AirPrint compatible printer. I don't have an AirPrint compatible printer. What now? Email your reports to a desktop or laptop from which printing is possible. You can also export your reports to a cloud service -- Dropbox or Google Drive, for example -- that's accessible by a desktop or laptop with printing abilities. Can I save reports on the iPad or to a cloud-based service like Dropbox? Yes. Make sure you have the cloud-based storage service installed and configured on your iPad. Other popular choices are iCloud (much improved since iOS 9) and Google Drive. Do you support the box score format favored by most newspapers? Yes. After displaying the Box Score, tap the Apple sharing icon and select "Share Text". Our state has a website for posting results -- can I post our results on that website? Yes, you can post your results anywhere you'd like. Our reports generate PDF, image and text output, though not all reports support all output formats. Can the referee sign the scorebook? Yes. Starting with iOS 11, using the built in Apple Annotation tools. For pre-iOS 11 installations, download the Adobe Acrobat app (free) from the app store. You can "share" the scorebook report with the Adobe Acrobat reader and the ref can sign -- finger tip or stylus -- the book in that app. Adobe Acrobat will keep a copy of the signed scorebook, it isn't stored in Takedown Scoring and Stats. Do you support auto-posting scoring results to Twitter? Do you support auto-posting results to Facebook? No. Facebook usage guidelines prohibit auto-posting. This feature was removed in Release 2.8.1. Sorry, not our decision. Do you support custom #hashtags? Yes, it's easy to add a custom hashtag to Twitter posts..
How is Takedown LIVE different from posting my results to a social network? Takedown LIVE displays detailed scoring action as it happens using the same scoring grid and notation as Takedown Scoring and Stats. Takedown LIVE is an app for iOS devices. Takedown Scoring and Stats posts to your team's Twitter timelines end-of-period and end-of-match scores, not individual scoring action. 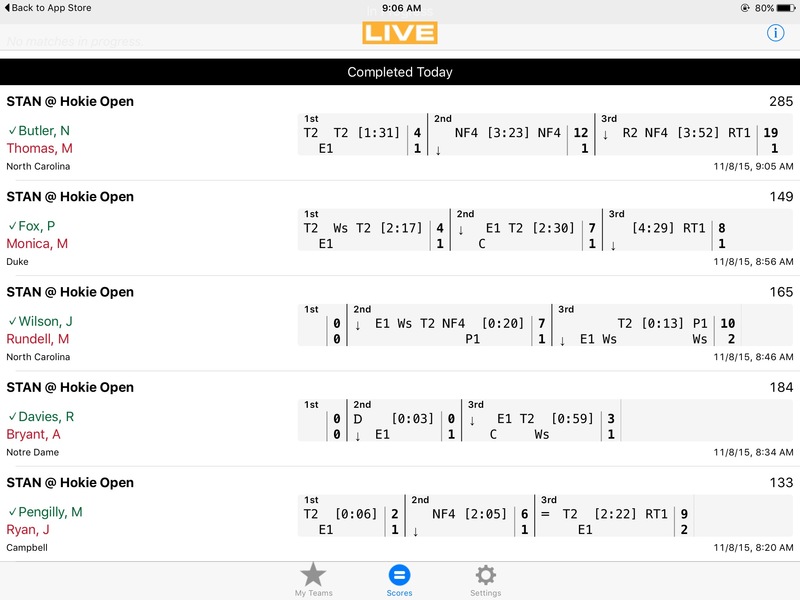 Use the Twitter or Facebook apps on mobile or a browser on the desktop to view the live scoring posts. Can I post to Takedown LIVE and Twitter simultaneously? Yes, you can post your results anywhere you'd like. Most sites accept PDF or text and both formats are available for the Box Score. Can I embed the live scoring results on my team's website? Yes, easily. To see an example on this website, click here. For instructions on embedding your Takedown Scoring and Stats automated scoring tweets on your team's website, click here. With some development effort, it is possible to have a Takedown LIVE-style presentation embedded on your team website. Can I install Takedown Scoring and Stats and Takedown LIVE on the same iPad? Yes. This is a convenient way for coaches to follow their team if its wrestlers are split between two venues -- JV in City A and Varsity in City B -- or between multiple gyms at the same venue. I see the Takedown LIVE symbol on various websites like WrestleStat. What does that mean? We make Takedown LIVE data available to qualified third parties to improve the availability of scoring-related information. WrestleStat is a one of our partners. See more here. If using a hard wired connection, the iPad must be running iOS 9. A Mini 1 is a good device to use for a hard-wired connection. What kind of display should I use? Any display with an HDMI input. We've tested displays with DVI inputs, using and HDMI to DVI converter, but it isn't as reliable as HDMI. Which aspect ratio is supported? Either 4:3 or 16:9 will work. Most digital displays are 16:9. What size monitor is supported? Any size will work. We've run on 20" computer monitors and ceiling mounted, four-sided Daktronics monitors at Stanford. Do you support Airplay and Apple TV? What does the buzzer sound like? Does the buzzer operate over HDMI? Does the buzzer operate over Bluetooth? Does the buzzer operate over the headphone jack on my iPad? Does the buzzer operate over my iPad speakers? Does the Scoreboard show team score? Yes, for dual meets. This feature is optional. Does the Scoreboard show next match wrestler names with win/loss record? Does the Scoreboard display team logos? Yes, for My Team and the Opponent if the logos are uploaded to the app. Where can I find team logos? We don't know of a central source for scholastic team logos. Some league or section websites have a member logo repository. School websites, of course, have logos. Is any of the stuff I do with Takedown part of the "official" record? No, it is entirely for the benefit of your team, staff and fans. Are you part of Trackwrestling? No. You can choose to save a lot of time by letting Takedown copy your match results and weigh-ins to your Trackwrestling account, but that's your decision. If you like typing, then don't use this feature. It's up to you. Does my state association have access to my data? Not unless you give it to them. You mean I can manage my team, easily score bouts, create accurate, useful and share-able statistical reports, post live results in real-time to other apps and our social media accounts, record and share match video, and setup a digital scoreboard for a better in-gym audience experience without getting permission or involving a sanctioning body?